The Cannes International Film Festival has just announced that a restored copy of Ila Ayn by Georges Nasser initiated by Abbout Productions and Fondation Liban Cinema will be screening during the Cannes Classics section during this year's 70th anniversary of the festival which will take place from 17 to 28 May 2017. Ila Ayn will be screened again in Cannes after 60 years of being part of the official competition in 1957. Abbout Productions and Fondation Liban Cinema announced in an official press release that they initiated the restoration, as they believe that Ila Ayn is "a national treasure that needed to be preserved and seen or rediscovered by a new audience on the occasion of its 60th anniversary." The restoration was made with the support of BankMed, in association with Nadi Lekol Nas and the Talkies. The press release also states that the restoration was done by Neyrac Films - France based on the original 35mm Fine Grain Master Positive that was scanned in 4k, retouched and color-corrected in a resolution of 2k. The sound restoration was done by db Studios - Lebanon. This new copy of Ila Ayn will look as good and new as when the film was screened in Cannes in 1957. Abbout Productions has also announced that it has produced a full-length documentary A Certain Nasserdirected by Antoine Waked and Badih Massaad that follows Georges Nasser's career and battles for the movie industry in Lebanon to exist, his life story is also the story of the birth and development of Lebanese Cinema. This documentary will be screened in a yet unannounced date that will also be a part of Ila Ayn's 60th anniversary celebration. In 1957, Ila Ayn was not only the first Lebanese Film to compete in the renowned French festival but also the first time a Lebanese film represented its country worldwide and put Lebanon on the world cinema map and the first Lebanese author film. 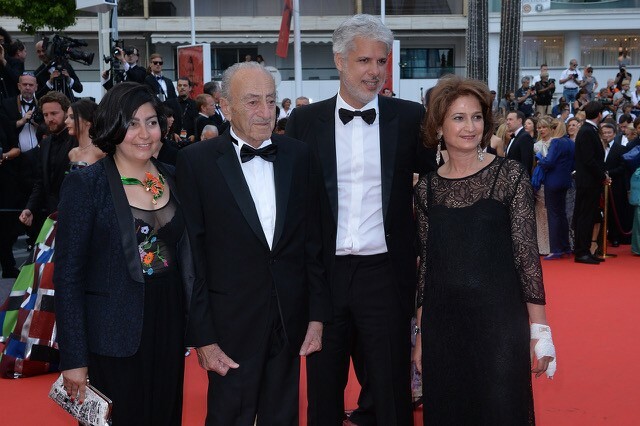 Georges Nasser went on to make another film Le Petit Etranger that was also selected to Cannes in 1962 and finally one last film Al Matloub Rajol Wahed in 1975. He hasn't directed any other film since then but despite his short filmography, Nasser who was born in Tripoli in 1927 is considered "the father of Lebanese cinema" and has left an undeniable mark on national cinema. Nasser was also honored this year by the Tripoli Film Festival, which screened a selection of his films, and by the ALBA university (Lebanese Academy of Fine Arts); who released a book about his life, career and influences. It's worth noting too that Georges Nasser studied cinema at UCLA in Hollywood and returned to his native country with the firm determination to make films in an environment where the industry was non-existent. After his three films made between 1957 and 1975, the eruption of the Lebanese civil war put an end to his career. Unlike the new wave of young Lebanese filmmakers who filmed the war, such as Maroun Baghdadi, Borhane Alaouie, Jocelyne Saab, Randa Chahal and Jean Chamoun, Nasser did not follow suit. Nevertheless, at no point did he consider leaving the country. He worked as a production manager on a few foreign films, such as Volker Schlöndorff's Circle of Deceit, and continued to write and seek funding opportunities for his screenplays. Unfortunately, time passed and money did not arrive. Nasser began to fight on another front: the creation of a Lebanese union of film technicians, another attempt that proved unsuccessful because of the incompetence of the state and the ministries concerned. Nasser finally found a satisfactory vocation as a teacher at the Lebanese Academy of Fine Arts (ALBA). He educates new generations in the art of making films. At the age of 89, he still has not retired, and his eyes shine when he talks about his great love of cinema.